How physically fit should I be to enjoy an Amazon trip? 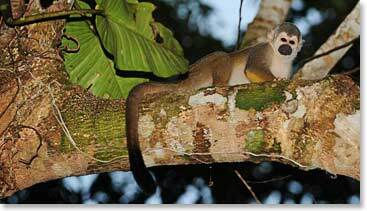 What wildlife will I see in the Amazon? Are there any health concerns for travelers? How are the flights to the Amazon? What should I wear for the activities? Can I recharge my camera and iPod while on this trip? 1. How physically fit should I be to enjoy an Amazon trip? 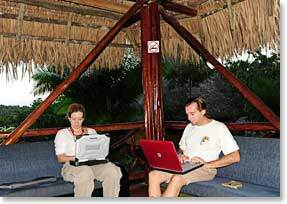 Activities on your jungle excursion can be individualized to suit your preferences and abilities. Short walking excursions – in hot temperatures – might be undertaken, but much of your travel will be by motorized boats and paddle canoes, which are paddled by the guides. International travel always requires that you consult you physician to evaluate risks and precautions that need to be taken, but we feel that enjoying the natural wonders of the Amazon is an adventure within the reach of most people. 2. What kind of weather should I be expecting? 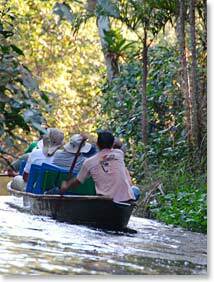 Yasuni is in the forest highlands of the Amazon Basin, still at about 250 meters (about 800 feet) above sea level. Temperatures range between 80° F (26° C) to 98° F (36° C) in the daytime. In the night it cools off with the early morning being the coolest. We have seen it as cool as 18° C (64° F) in the morning. It can rain at anytime of the year, but rainstorms tend to be light and transient rather than continuous. When you pass through Quito you will be in a mountain environment, with pleasant, cooler temperatures. You will be near the equator, but you will also be at 2800 meters (9,200 feet) above sea level. It is springtime all year in Quito according to its proud residents. Long sleeves and light jackets will be required here in the evenings. If you ride the gondola to the higher elevations above the city you will need warmer clothes. 3. When is the best time to visit the Amazon? You can visit the Amazon of Ecuador at any time of year. Because it is on the equator there is little to no variation in the length of days or temperatures. Sometimes we jokingly say “there is a rainy season and a rainier season”, but we actually find good weather for viewing the jungle and the wildlife throughout the year here. 4. What wildlife will I see in the Amazon? The list of things to look for might honestly be described as endless. This is one of the most ecologically diverse regions known to man. But to keep it simple and brief you can start with at least 6 – 9 varieties of parrots, tucans, macaws, otters, cayman alligators, anaconda snakes, three toed sloths and countless butterflies. Your naturalist guide will be guaranteed to tell you about and show you species of birds, insects, reptiles and mammals; some that you have never heard of and that you will appreciate discovering. Of course, this is a paradise for children! Staff at the lodge are always attentive and entertaining. This would be an enjoyable and educational experience for children of all ages. We have known of people hiring some of the wonderful local women as babysitters for very young children. The guides say that children over the age of 12 usually seem most interested in the learning opportunities of the Amazon. 6. What kind of currency is used in Ecuador? The official currency in Ecuador is the US dollar. Bring plenty of small US dollars as Ecuador is not an expensive place. US $1, $5 and $10 dollar bills are easy to spend; US $20 dollar bills are also convenient to have. Bring $50 dollar bills and $100 dollar bills for backup, but do not expect to change them easily. 7. Are there any required vaccinations for Ecuador? Unless you enter Ecuador from a country where yellow fever is a risk, vaccinations are not required when entering Ecuador. However we do advise you to get the following vaccinations: Tetanus / Yellow Fever / Typhoid / Hepatitis A&B / Malaria prophylaxis. Please contact your doctor about vaccinations before visiting Ecuador. There has not been any cases of tropical diseases (malaria, yellow fever, cholera) reported by foreign visitors to Yasuni National Park. 9. Are there any health concerns for travelers? You guide will help you make healthy choices during your trip. We recommend that you drink bottled water while traveling in Ecuador, or other beverages you know to be safe. Excursions from Quito into the surrounding countryside will be at elevations of 9,000 feet and above. Travelers with a history of heart conditions or high blood pressure should consult their doctors before the trip for guidance. 10. When should I book my flight? One of the advantages to travelling to Ecuador is that the International Airport in Quito is served by a number of Airlines. There should be good options for you based on your point of departure and airline preference. Flights through Houston on Continental and Miami on American Airlines are examples. Please call us if you would like suggestions or assistance with booking your flights. 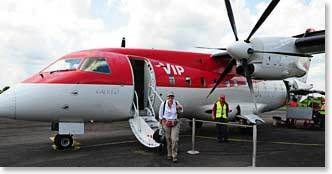 Berg Adventures always recommends an extra day in Quito before leaving to the Jungle and at the end; in case of unexpected delays due to any flight connections. 11. How are the flights to the Amazon? Planes to the Amazon depart from the capital city of Quito; we will fly to the city of Coca; the flight is thirty minutes long. 13. What should I wear for the activities? Try not to wear any colourful clothes so that you can better blend with the environment. They also might attract more insects. Long pants are more comfortable than shorts while hiking and on the boats. They also keep insects and sun off your skin. You will want shorts or a bathing suit for swimming. 14. What is the food like on the trip? We will enjoy first-rate meals in fine restaurants and hotels along the way. At the resort, the food is simple, well cooked fare, served with style and with an emphasis of showing off local dishes. Individual diet restrictions are always catered to and you will find the food service staff is eager to please. They will accommodate nearly any request with creativity and flair. In Quito, we will be staying at the 5 star hotel Swissotel; at the Amazon resort the rooms are excellent and quite big (over 450 sq. ft.) with private bathrooms, hot showers, private balcony, ceiling fans and electricity 24 hours a day. 16. What kind of camera should I bring? 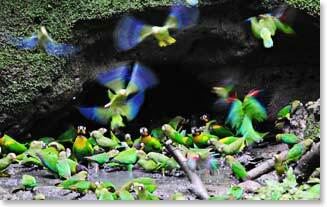 There will be fantastic opportunities for photography throughout your adventure in Ecuador. People and their colourful costumes and lush landscape as well as wildlife shots are some examples. Digital point-and-shoot cameras are always right because they are small and easy to keep handy. Be sure you bring one that is rugged however. It is also important to know how to use your camera. Get familiar with it before your trip or you might be disappointed with the results. SLR cameras with interchangeable lenses are worth the extra weight and expense if you are into it. Do not hesitate to bring yours. 17. Can I recharge my camera and iPod while on this trip? Yes! All of the hotels and our Amazon resort will have electrical outlets. 18. Do you have access to radio communications for any emergency needs? 19. Will my cell phone work in Ecuador? Probably, but be sure to check about the rates with your service provider before you leave. It may be cheaper to use local phone services in Ecuador or to use the Internet. 20. Should I bring my laptop? Wireless connections are available from our lodge in the Amazon using satellite connections. You may also use the lodge computers also for an additional fee, but some people prefer to have their own computer. The extra weight and hassle will not be worth it for everyone, but you should consider this option if you like to review and back up your digital photos each day. 21. What books do you recommend? "The Smithsonian Atlas of the Amazon"
"Insight Guide to Ecuador and Galapagos"
Bird, Plant and Wildlife guides in English for the flora and fauna you are most interested in. The lodge also has a good library.